As the 2014 proxy season takes shape, more investors than ever are seeking transformation of corporate environmental, social and governance (ESG) policies. A record-breaking 417 social and environmental shareholder resolutions have been filed so far this proxy season, with political spending and climate change driving the majority of the activity. This year we have broken every record on the number of resolutions filed, and over the past decade the average vote in support of social and environmental resolutions has nearly doubled. Shareholders today are looking not at these issues in isolation. Instead, they articulate a systemic critique, pointing out the connections between excessive political spending, inadequate energy policy, the dangers of our changing climate and its damaging impact on water and agriculture, toxic hazards, and how these are related to human rights. 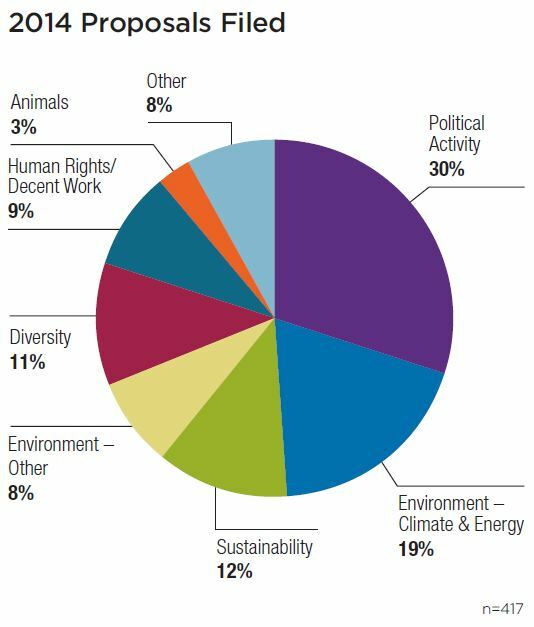 Investors' strong demand for more disclosure of corporate political spending before and after elections account for almost a third of shareholder ESG resolutions. Proposals on climate change, energy, and their related risks — as well as interconnected questions about corporate sustainability strategies and transparency — have also grown, and account for about another 40 percent of the 417 resolutions filed to date. Human rights and diversity on boards and in the workplace make up most of the rest. The flood of corporate political activity proposals continues unabated, and it's not just looking at electoral spending. A broad coalition of investors want companies to tell stockholders and the public more about what they spend before and after elections, both directly and most particularly through intermediary groups responsible for what some term "dark money" in the public influence game. The corporate political activity disclosure campaign has broadened in the last three years with an array of suggested responses to the new spending landscape opened up by the 2010 Citizens United U.S. Supreme Court decision. In the backdrop of this year’s shareholder campaign, further big modifications of campaign finance law may come any day from the court in McCutcheon v. FEC. Resolutions on climate change and environmental issues are the second largest category of proposals filed. Investors are demanding greenhouse gas emissions reductions and disclosure. New carbon asset risk resolutions are asking companies if they are prepared to succeed in an increasingly carbon constrained world, amid fears of stranded carbon assets and the potential of a carbon bubble. The exploding shale energy business has intensified concerns about methane emissions, a far more potent greenhouse gas than carbon dioxide. This proxy season looks to be exciting and dynamic as issues that have been simmering over the past few years come to a full boil. Extreme weather and extreme politics are spawning extreme advocacy, while at the same time more and more companies are sitting down with their investors and finding common ground on the critical issues of our time. Learn more about the issues investors have raised with their companies this proxy season in Proxy Preview 2014, a report As You Sow publishes annually with the Sustainable Investments Institute and Proxy Impact. Proxy Preview 2014 is the 10th edition of the report hailed as the "Bible for socially progressive foundations, religious groups, pension funds, and tax-exempt organizations" by the Chicago Tribune. Proxy Preview assesses the shareholder resolutions, how companies are responding, and policy changes affecting the proposals at the Securities and Exchange Commission (SEC). Andrew Behar is the CEO of the As You Sow Foundation (www.asyousow.org), a nonprofit organization dedicated to increasing corporate environmental and social responsibility.